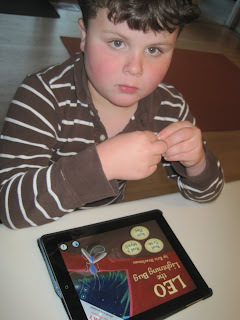 SQUIDALICIOUS: Leo the Lightning Bug App! We are unabashed fans of Oceanhouse Media, the developers behind the interactive Dr. Seuss books apps Leo loves so very much. So we were tickled to find out that their latest interactive book app, just released today, is called Leo the Lightning Bug (introductory price: $2.99). Written by Eric Drachman and illustrated by James Muscarello, Leo the Lightning Bug captures emotions many children feel growing up. Leo is “the littlest lightning bug of all” who can’t seem to make his own light. Despite other lightning bugs teasing him, with determination, motherly support and a little luck, Leo eventually lights up in the night. With his newfound confidence, Leo now laughs at himself, plays with the other lightning bugs and enjoys a good night’s sleep. While our Leo enjoys the app thanks to Oceanhouse Media's thoughtful use of consistent interface navigation -- it works just like every other one of their books -- his little sister Mali has become a big fan. She even found the app in the "to review" folder I'd hidden it in, and told me the entire story before I'd had a chance to read it myself, or with Leo! Leo the Lightning Bug is a very sweet story for any kid, and (again, like other Oceanhouse Media titles) had the click-each-word-to-hear-it-read-aloud functionality that is especially useful to kids who, like my own Leo, are not yet fully literate, as it allows them to "read" books to themselves. I hope your child enjoys this book, whatever their wonderful name may be. Leo's Tree More sweetness, as a boy named Leo and his tree grow up together. Good Night, Leo A "Swashbuckling adventure" as another Leo says good night to each item in his pirate costume. Good modeling for step-by-step transitions! you are going to brainwash me into getting an iPad for G... just wait and see.... it may take a while but will happen. Heh. You let me know when it happens, and if you feel like being bombarded with iPad advice!